Car Rental Guide for online car rental & car hire in Polokwane, South Africa. Competitive car hire rates. All vehicle types - sedan, 4x4, SUV, minivan & pick-up. 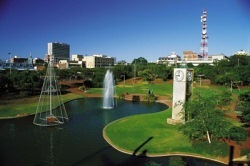 Polokwane is the major centre and capital city of the province, indeed for the country's entire area north of Gauteng. Polokwane holds an enviable position. Its proximity as a major centre near the neighbouring countries of Botswana, Zimbabwe, Mozambique and Swaziland make it a strategically located, fully equipped destination, and it is within convenient distance from the Kruger National Park and Magoesbaskloof.